Having rested up, the reinforced group opened the secret door concealed in the back of the surprisingly clean iron maiden. The rough worked stone passageway slowly filled with a mist as they worked their way forward. Some dozen yards later, it ended in a steep falloff to a new floor some 30 feet down. The scouts had no problem descending, and re-ascending 50 feet further ahead where the passageway continued. As the group proceeded forward again, they unworked stone corridor began to once again show signs of having been worked. Turning the corner and proceeding, a sudden horn blast echoed toward them from ahead as a net dropped onto the middle of the group. With only a moment to catch their breath, the forward guards raise their defenses just in time to see a group of wolf-riding goblins charge from around the bend into the entangled midst! A frantic battle ensued, leading to a defeat of the goblins, but not without casualties on the side of the heroes. The newly rescued Dwarven Fighter/Thief and Monk/Magic-User were amongst the dead; the former claiming some vengeance on his captors before this fall, but the latter falling to the charging goblins before he had a chance to act. My friend’s kids have gotten to the age where they can “get” TTRPG. As others have noted, with the popularity of MineCraft, many middle-school aged kids now are very familiar with the D&D tropes (hit points, experience points, leveling, skeletons and monsters, etc! ), so it’s a small jump to tabletop RPGs. 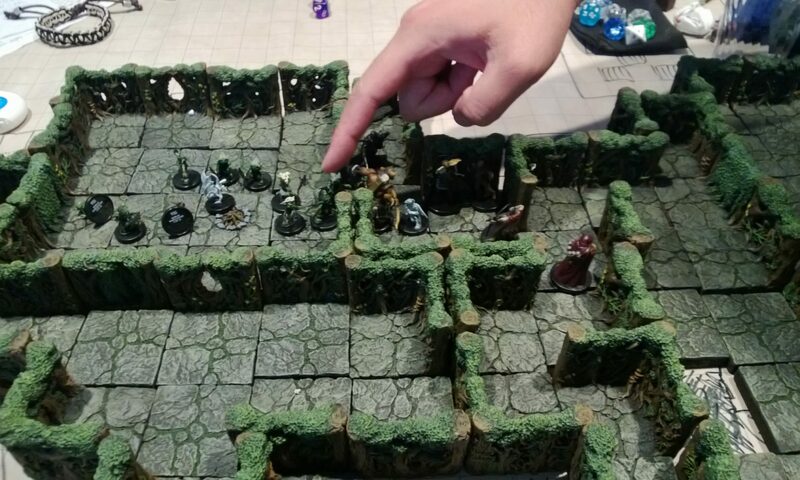 This weekend, we had a little gaming convention with a bunch of friends; as a prelude, I ran the little ones through some introductory D&D games. I gave them free reign with Dwarven Forge tiles to build some layouts, then gave them a scenario.